1958, in a deserted farm in Oslo: A Norwegian officer suspected of Soviet espionage is being tortured to death. 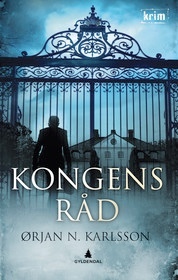 Present: Two Norwegian ambassadors die under mysterious circumstances. Parallelly, a female Russian oligarch has discreetely managed to settle in Oslo. How could this have happened? Kyrre Kaupang has become an important figure in the intelligence organization The Foundation, a half-democratic intelligence institution surviving the Cold War. They have begun investigating the first ambassador’s death, as they are promptly informed from the highest teams to interrupt the investigations. “The Foundation” decides to investigate in spite of the orders. Who is the Russian oligarch based in Oslo? And why are the deaths of the Ambassador a threat ? Is there a connection between the deaths and the post-war history’s biggest espionage scandal? Dangerous forces realize that Kyrre Kaupang and his colleagues are on the right track. There are strong links between the events of 1958 and the present killings; and powerful enemies wants to silence Kyrre Kaupang…. Ørjan N. Karlsson has delivered the best crime of the summer in his conspiratory and disturbing" King's Council"
In the King's Council, we see a trained author´s craftsmanship. Exciting and fun.